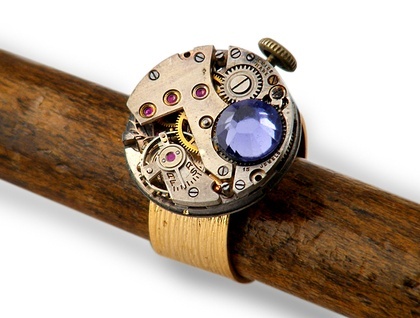 This is a fascinating Steampunk inspired ring that will be a great conversation starter wherever it is worn. 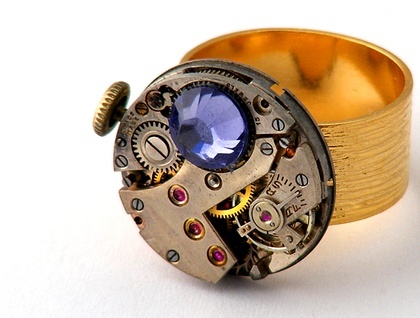 The focal of the ring is a vintage watch movement 20mm across and layered with intricate mechanisms with the original rubies glistening on the upper plate. 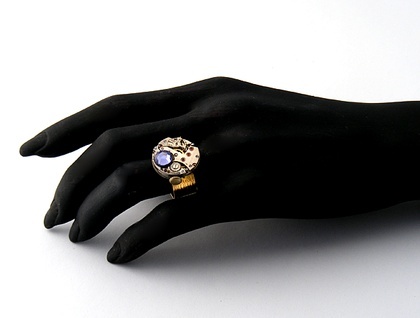 The ring is mounted with a Swarovski Tanzanite crystal cabochon - the colour is a delicate pale lavender which complements the steel perfectly. The ring has an expandable gold plated 10mm wide band with a brushed finish. It is smooth and very comfortable to wear and measures 20mm across. Pulling gently on both sides expands the ring from a discreet overlap behind the focal. 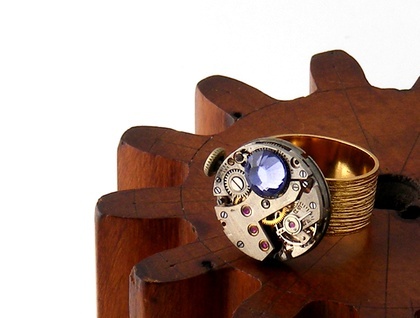 This ring is unique, designed and handmade in New Zealand, the combination of vintage parts ensure that there will never be another quite the same. The ring will be delivered to the buyer in a handmade ClosetGothic black felt envelope.